Happy Memorial Day, folks! Not every festive dish needs to be heavy, meaty or fatty. 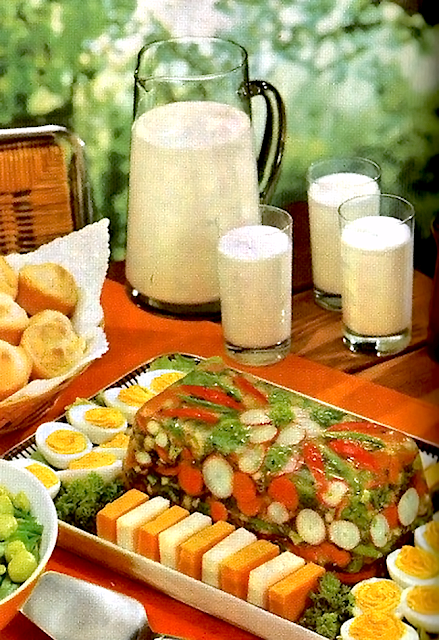 Here's a refreshing vintage salad idea to get your guests gabbin.' With this imaginative, light and wholesome Garden Salad Loaf, you'll be serving veggies that keep flavorful and fresh all day in the sun. You're sure to be the talk of the picnic with this fun and nutritious dish! Combine first 5 vegetables and marinate in French dressing at least 15 minutes. Combine gelatin and sugar. Add hot water and stir to dissolve. Add vinegar and lemon juice. Chill until gelatin thickens. Drain vegetables well. Fold marinated vegetables and crisp greens into gelatin mixture. Pour into oiled loaf pan, 8 1/2 x 4 1/2 x 3 inch. Chill until firm, overnight is best. Unmold on platter. Serves 10-12. Special Touch: Pour about 1/2 cup dissolved gelatin mixture into loaf pan and allow to set. Make interesting pattern with radish slices, green pepper and tomato slices or strips. Spoon a little gelatin over vegetables to anchor them. Allow to set before adding vegetables/gelatin mixture. Variation: Omit unflavored gelatin and sugar. Substitute 2 (3 ounce) packages lemon flavor gelatin and 3 1/2 cups very hot water.